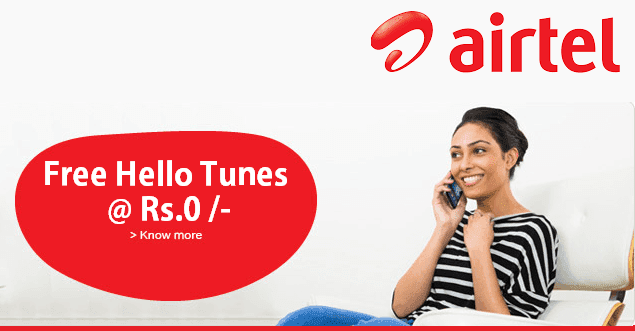 If you want to rid off with a default ringtone and also, want to set up your favorite song hello tune then you should think about the Airtel hello tune service. Airtel hello tune is really an exciting service that lets you make a caller tune of your favorite song. You can entertain your callers anytime whenever they call you up. So if you want from your callers to call you often then it is better to select your favorite song and set it up as your caller tune. You get a huge collection of songs on Airtel hello tunes but it charges an amount as per plan you purchase for your Airtel number. How to set caller tune in Airtel? You can set the favorite caller tune of your callers in your Airtel number. Callers will be able to hear a caller tune until the phone stops to ring. It may bring a smile on the face of your callers whenever they make a call to you even it increase the chances to receive more calls from your special ones when you set their favorite music as a caller tune. If you feel unsure about selecting the perfect one caller tune then you should try the given list of trending tunes. There is a large compilation of songs you can find here on Airtel hello tunes if you are thinking about to set caller tune on your Airtel number. The songs you can find here include Bollywood, devotional, regional, classical and many more listed there. You need to pay some of the charges according to plan what you choose. One can also try Jio Caller tune, it’s completely free and you can change any number of time without any cost. Firstly, you need to dial *678#. Now, a popup appears on your mobile screen. Hereafter, just enter the particular option for which you ask and at last, just press the send button. First, you have to make a call on 543211. Now, it is quite essential for you to follow the given instructions on IVR. But here you need to pay the calling charges Rs.3 per minute. If you want to subscribe the Hello tunes you need to pay Rs.30 for 30 days. One another way you can try, you just make a call on 543215 then speak the name of the song or a movie for which you are looking to set your favorite caller or hello tune. Now select the language. Afterward, you have to speak the name of music album or movie for which you intend to search. The system plays from here all the songs found one by one. So all you need to do is select the particular song which you like to set as your caller tune or hello tune. Firstly, you are required to open Airtel Hello tune web service then choose the song from the given list. At last, enter the received OTP on your mobile. The song has been set there as your caller tune or hello tune. You can confirm it by saying someone to call on your Airtel number. It may bring a smile on your callers face when you greet them with a best hello tune. So if you intend to do this you are required to subscribe for the hello tune. All you need to do is, just call on 543211. Furthermore, you can also message on 543211. Meanwhile, you have to put the song code for which you are looking. But it is better to keep an appropriate amount else you may interact with some trouble while subscribing for the caller tune. You can also contact to the customer care if you still feel any kind of issue. How to deactivate caller tune in Airtel? Caller tunes are getting very popular among people nowadays. Most of the time people get bored with the same ringtone and they consider deactivating the ringtone and look for the new one. We can try to disable it if we feel bored after using a specific caller tune for long days. But how can we deactivate our caller tune? It is quite simple to deactivate the caller tune and that can be done within minutes. There are three ways we can try to deactivate our Airtel hello tune from our Airtel number. If you want to unsubscribe the hello tune by an SMS then you can type STOP and send it to 543211. You can also call on 543211808 to deactivate your hello tune services. Likewise, you can also deactivate the caller tune service by using an USSD code where you have to dial *678#. Hope you get answer to all your queries related to Airtel Caller tune, now you can set your favourite song as a hello tune easily. If you have any issue, you can write in comment.